Greetings of Universal Peace, Love and Joy. Welcome to the Yellow Warrior Wavespell on this August 22nd 2018 Gregorian World Year Date. 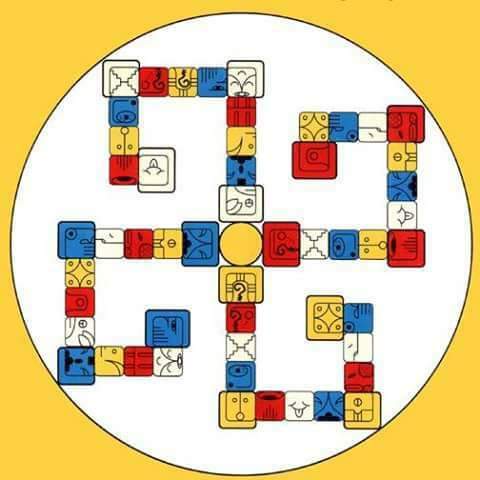 Yellow Warrior Wavespell is Wavespell Number 16 of 20 Wavespells that are encoded in the sacred Tzolkin. 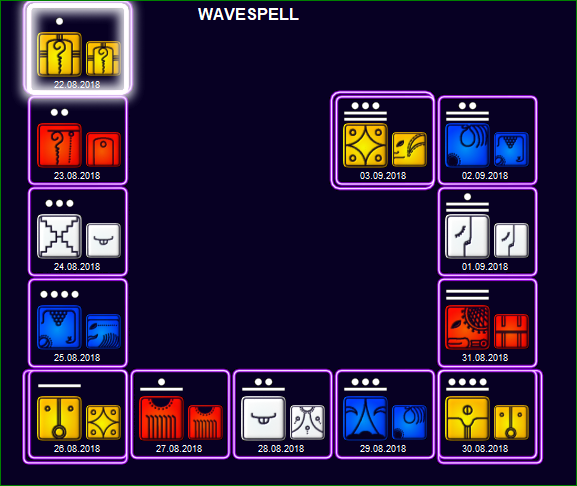 Yellow Warrior Wavespell lasts from Kin 196 Yellow Magnetic Warrior ( Gregorian August 22nd 2018) to Kin 208 Yellow Cosmic Star ( Gregorian September 3rd 2018) . Kin 196 – Precept 40 – Spiritual self-sufficiency is a function of discipline which is a continuing spiritual sacrifice of the lower self for the sake of inner perfection, or the coming out and polishing of the divine incarnate self or form within. Yellow Warrior qualities: Grace, trust, inner voice, fearlessness, courage, cosmic consciousness, high standards, galactic conduit, mystic transmission, divine communication, golden pillar, ferryman’s staff, reception, intelligence. Yellow Warrior is a conduit for cosmic communication, offering access to the universal web of consciousness. This is the web of the Mayan mystic spider that weaves intergalactic threads, the conduit of interconnected consciousness. Yellow Warrior is the spider in the web, the grid connection for divine communication. Receive these ripples of knowing from Yellow Warrior’s web through the central axis in your spine, your staff. Accept this gift of knowing in grace, as you would receive the morning light by turning your face to the Sun. Grace is an unexpected touch, a blessing given in love, a natural gift from the universe. Use the power of love like an electrical current to serve the light. Open fully to feel and receive it! 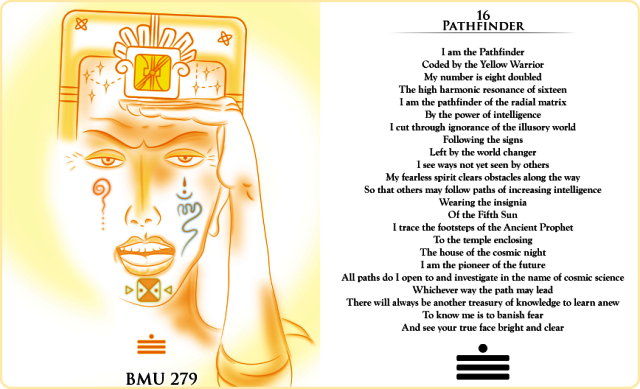 The number for Yellow Warrior is sixteen, the number of unity with the cosmic foundation of resonant evolution. As you embody the ferryman’s staff, you become anchored in your connection to cosmic consciousness. Holding within you the foundational steps of the trinity, you carry the “Christed one” into the world. As a living mystic, you are the conduit of the spiraling galaxies that creates a union with cosmic consciousness. Sixteen may also be seen as the beginning of another octave – a higher octave characterized by organic balance and the new Earth under your feet. 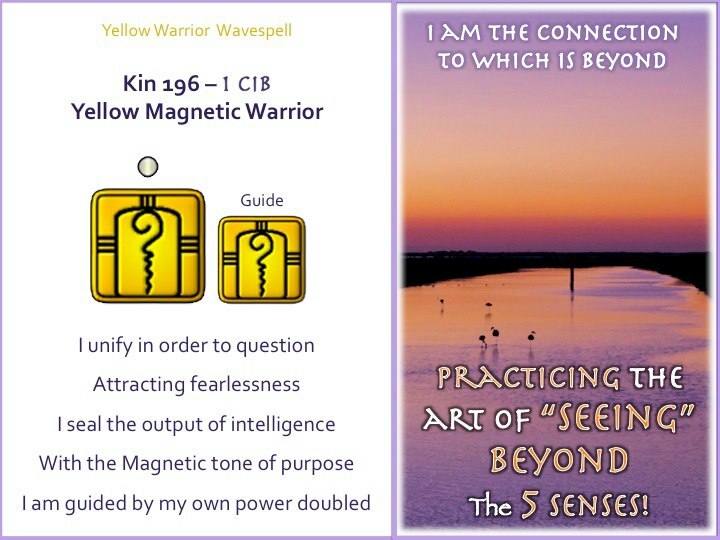 From Dreamspell Genesis : Finally completing the Yellow Southern Castle of Giving, the magnetic gate of the Warrior presented itself.Through casting the Warrior wavespell of intelligence, the kin increased their fearlessness of magical giving. Full blown was the capacity of the planetary kin to share in their gifts. Equal to each other were they in their ability to give themselves to each other according to the needs of whatever adventure might arise. 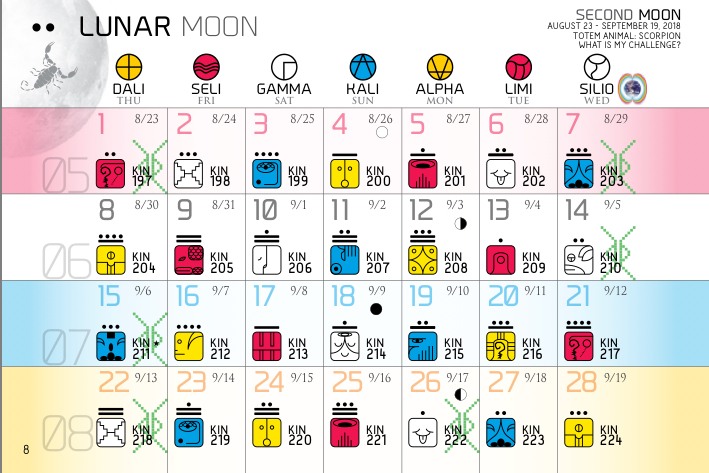 In this Wavespell we also exit the first moon of the new kin 169 Red Cosmic Moon Year and begin the Lunar Moon of Challenge on Kin 197. Look overhead around 10 p.m. local daylight time and your eyes will fall on the brilliant star Vega in the constellation Lyra the Harp. At magnitude 0.0, Vega is the brightest member of the prominent Summer Triangle asterism. The Triangle’s second-brightest star, magnitude 0.8 Altair in Aquila the Eagle, lies some 35° southeast of Vega. The asterism’s dimmest member, magnitude 1.3 Deneb in Cygnus the Swan, stands about 25° east-northeast of Vega. The Summer Triangle is one of the most recognizable asterisms in the night sky. It consists of the bright stars Deneb (far left), Vega (top left), and Altair (lower middle). The Moon moves about 13° eastward every 24 hours, and tonight it pulls into Mars’ vicinity. As darkness falls, the Red Planet lies some 8° to the Moon’s lower right. Mars remains a beacon, shining at magnitude –2.3, and stands out despite the Moon’s proximity. When viewed through a telescope, the planet’s disk spans 22″ and should show some subtle surface details as the global dust storm continues to abate. The Moon reaches apogee, the farthest point in its orbit around Earth, at 7:23 a.m. EDT. It then lies 252,119 miles (405,746 kilometers) from Earth’s center. Mars continues to move westward relative to the background stars, and today it crosses the border from southwestern Capricornus into eastern Sagittarius. But its stay among the Archer’s stars won’t be lengthy. The planet reaches its stationary point on the 28th and will move back into the Sea Goat on September 1. May you have a beautiful warrior Wavespell! 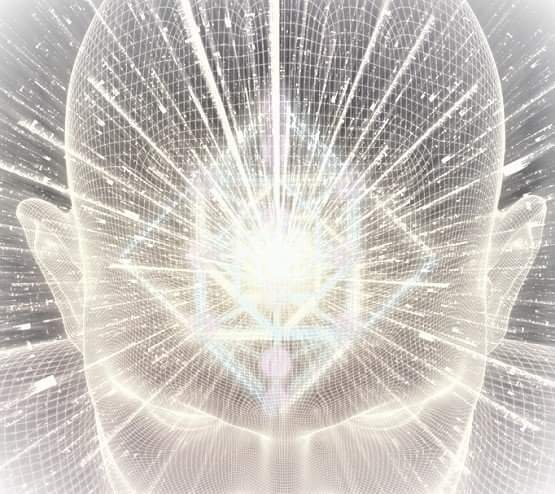 Perceptions reformulated according to the frequencies of the Master Cube resonate forever from within.